Dark Dimensions: Blade Master is rated 3.0 out of 5 by 9. Rated 5 out of 5 by denniann2 from low ratings.......why??? not sure why this game got such bad ratings. i liked it and the story. there is a custom level and the hint system will take you where you need to go. you have stopped at a restaurant on your way to ashburn university where your friend has asked to meet you. your husband is wounded by some evil being that throws knives as well as another. you then try to figure out what is going on and after you do figure it out you are not sure what can be done. sequel..i believe so by the way this game ended. Rated 4 out of 5 by ninja226 from A perfectly good HO game, but mediocre story If you appreciate good artwork, good voiceovers, and movie-like animation, this game fits the bill. The HOS are fine with me. Mini games are mostly easy, but there were a few challenging ones. The only downside of the game is the story isn't that gripping and somewhat formulaic. The story didn't have a good build up of tension, mystery and suspense. But I did enjoy the artwork and snazzy special effects and found it perfectly fine. Rated 4 out of 5 by pennmom36 from The Story Of The Unknown Blacksmith It's your first Anniversary and after a long day traveling you decide to stop for dinner and a one night only show, The Blade Master. Knives begin flying about the room and it becomes apparent that the Master has nefarious plans in store for this small town of New Auburn! Your husband is one of the Blade Master's victims, and as he lay on the stage, mortally wounded, it becomes all too clear that the knives have peen laced with a deadly poison. You know you must leave his side and chase after this evil doer if there's any hope of finding the antidote to save your husbands life! It doesn't take long to figure out that The Blade Master might just be an unintentional result of a discovery made by a local Professor. In fact, Professor Piper and one of his assistants, Rachel Miller, are missing, his other assistant Sabrina King was found near their excavation site...but, with absolutely no memory of the incident itself! Welcome to the Dark Dimensions, evil forces that appear after a tragedy occurs! There seems to be a pattern lately, with some of the core series games, the storylines are becoming watered down and way off track from the original plot, Blade Master is a prime example of that. Most of these games are no longer creepy, dire or scary, they seem to be floating somewhere between a fairytale game and a family oriented G rated movie. I like fairytale fantasy games, I just don't like it when that theme is presented in a game that has become popular BECAUSE it was a dark scary game genre. What's next, Madame Fate turns the carnival into a bright and happy toyland with pink fuzzy bunnies and happy faced balloon blowing clowns that get kidnapped by a giant purple unicorn? There are no possessed children, no ghosts maliciously wreaking havoc, no imagination, just more of the same, so for that reason, I cannot give this Dark Dimension 5 stars. It's a good game with really good graphics, but it's no Dark Dimension, perhaps it's an almost Dark Dimension that is desperately trying to be, but couldn't go the extra mile. Once you begin to hunt down the man responsible for poisoning your husband, you will receive an intricate Knife Box that was left behind by the Blade Master. Throughout the adventure you will find pendants that open up different compartments on the box, and each compartment holds a knife. Each knife is used to open gates and various locks that are meant to deter you from following him as he attempts to flee. There are several Plus Sign inventory items that require some type of interaction before the item can be used, some of which are small puzzles to solve such as rotating discs to line up correct symbols. In the Collector's Edition, each scene has a Morphing Jigsaw Puzzle piece to locate, some of which are cleverly blended into the scenery. When you find all the pieces, you can assemble each of the 4 puzzles, rotating the pieces with the rotation arrows at the bottom right of the puzzle itself. That's about it with the Collector's Edition, there are no Achievements, or other collectibles available, which make this Standard Edition the better option in my opinion. 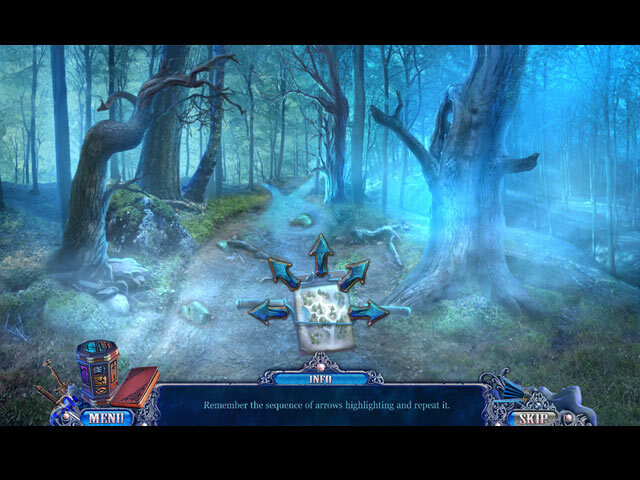 The Hidden Object Scenes are decent, but nothing to write home about. 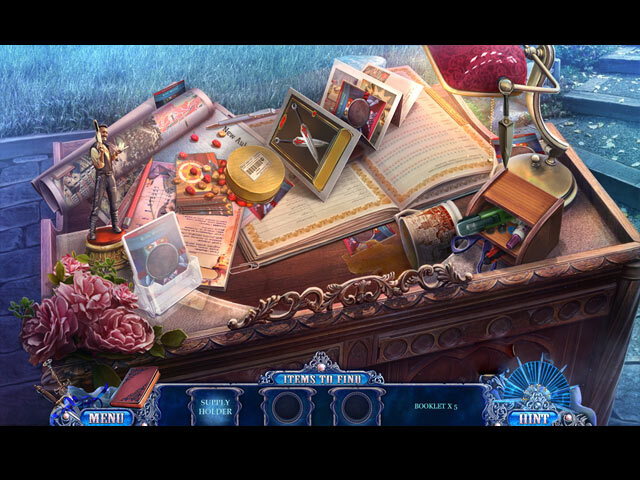 There are scenes where you find Multiples of items, Progressive and Interactive listed item finds and Multi-layered scenes, some of which have a puzzle such as clicking on two broken board halves that belong together. I did enjoy the one where you are tasked with finding 12 knives that have been thrown at you and are frozen mid air with a 3D type effect. I was actually surprised at how well hidden a few of those knives were. The Mini Games are decent as well as entertaining, nothing too easy or too difficult. The following are brief descriptions of some of the games you'll encounter during the demo as well as a few notable puzzles offered in the main game itself: 1) Place blade fragments onto the correct knives according to the shape of the fragments. 2) Assemble the mask using rotational arrows to turn the mask until the fragments are lined up in the correct position to snap onto the mask. 3) Swap the inner gray plates until they match the outlines of the copper shapes, by swapping the teeth, the teeth can only swap to specific positions shown. 4) Light up all of the candles, clicking on one candle may affect other candles. 5) Use arrows to rotate the loose branches so they will fit over a gem and connect with other branches. They will shine if placed correctly. 6) Rotate the gears to put the related knives in their place, clicking on one knife affects others. 7) Complete the picture by moving the blades, some blades affect others. 8) Complete a puzzle by swapping stripes, some strips affect the movement of other strips. 9) Rotate circle sections to complete the image. 10) Click on a specific number of points on a map grid to navigate from point A to point B anticipating the movement of weather elements to avoid along the path. 11) Move the mask parts to the correct colors side. Pieces cannot move within 2 spaces of the opposite color. The Collector's Edition has 19 Developer's Diary photos, 11 Concept Art photos, 6 Wallpapers, Morphing Jigsaw Puzzle pieces (which have 12 pieces in each of the 4 different Puzzles to assemble) 4 Music Soundtracks, a built in Strategy Guide and a Bonus Adventure Chapter, enjoy! Rated 3 out of 5 by skullfun from Dark Dimensions Blade Master 7th in the series just okay... Dark Dimensions was once a unique series. The first three installments were thrilling and creepy, just as their titles promised. However, all of the sequels after that turned the series into just another dark fantasy HOPA series, and isn't there already plenty of that in the market? Despite its fairly interesting plot, Blade Master faces this same problem. Blade Master blasts off with an exciting sequence, featuring knife-throwing and actual violence. Violence is definitely not something usually seen in casual games, so I am kind of glad to see Daily Magic taking the risks and freshen up the genre. Anyhow, it is difficult to disregard the fact that given the insane number of instances where knives are thrown right at the heroine, she manages to miraculously dodge them every single time. Regarding the production, Dark Dimensions: Blade Master is nothing short of impressive. The graphics are absolutely stunning - appropriately dark and gorgeously-colored. The soundtracks did a great job in building the tension during action sequences. In contrast, I found the voice-overs to be slightly awkward at times. If you have ever played any one of the games from this developer before, Dark Dimensions: Blade Master will be pretty predictable. The game doesn't necessarily break away from the typical HOPA formula and that makes the game a no-brainer for advanced players. This is not to say that the game is not well-made, because it is. 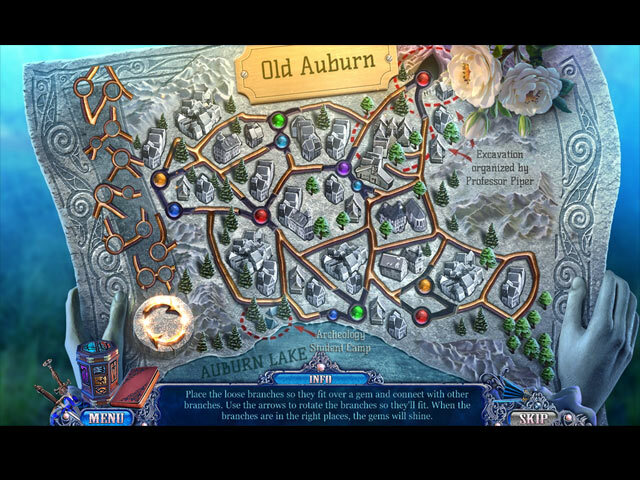 The adventure portion is polished, while the hidden object scenes are entertaining and the puzzles are quite clever - if not too easy. Moreover, the game comes with a Knife Casket, which at first seems like a really cool feature, but turns out to be just another dull gimmick. Besides, Dark Dimensions: Blade Master is just a very short game. The main game took me just a little over three hours to complete, and the bonus chapter took another 40 minutes - on the easiest mode of difficulty. The Collector's Edition includes a strategy guide, a developer's diary, soundtracks, wallpapers, concept art and hard-to-find collectibles. Some reviewers posted that this edition was not CE worthy, so give the SE version a try. 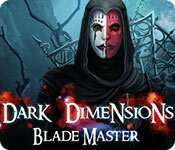 Dark Dimensions: Blade Master is far too easy for a HOPA master. Apart from the graphics, there is nothing else to write home about. At the end of the day, Dark Dimensions: Blade Master is just another game on the long list of dark fantasy titles. Rated 2 out of 5 by bessiegirl from What a waste of a credit I have all of this series and have enjoyed them therefore when I was going to lose my credit today I just purchased this without demo. Honestly? I don't think I would have even made it through the demo. Slow, awkward game with HOS after another and really old school puzzles. Thankfully the game had a custom option and I could set the hint and skip to 1 sec. Transporter map was not the best so I just used the hint to navigate around. I bet I didn't last 30 minutes before I couldn't take the boredom, the silly, slow, awkward and annoying dialog. Real dumb storyline...the whole game seemed choppy and just plain annoying. Oh well, I would have lost the credit anyway, might as well lose it on a loser game. I would have given it a 1 star but I don't use the word "hate". (I wish they would change that.) What in the world happened to this series? Rated 1 out of 5 by crisgori from The end of a wonderful series I used to love the Dark Dimension series. Once. Now I hate it and I won't buy another game of this: what we have here is just another meaningless "walk forward" game. If you used to love the former Dark Dimensions games don't waste your money on it. Or a coupon code either. Rated 1 out of 5 by RavynWytch from Don't waste your time Although this game was fun, and just challenging enough, I blew through the demo in less than 30 minutes. Doesn't really make me want to buy it if I can get through the demo that fast. Not thrilled at all that it was so short. I guess if you get the full game, it might be more fun, but I'm not taking the chance that the game might just be that short.